Like a fossil, the "Marx-Engels-Forum," a large, ambitious monument project from the former German Democratic Republic (GDR), adorns a central and historical spot in the middle of Berlin. 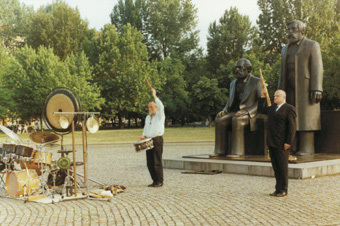 Juergen Boettcher's experimental documentary incorporates his own footage from 1981-1986 about the creation of this monument into new material, shot exclusively on location at the Marx-Engels-Forum. A vast collage with numerous levels: documentary shots of the artists involved at the time, and above all, intense observations of today's visitors to this square's anachronistic monument ensemble. Groups, families, couples, tourists from around the world all have their pictures taken in front of the stiff, stoic figures of Marx and Engels. Percussionist Guenther "Baby" Sommer and saxophonist Dietmar Diesner are the musical guides through the film, giving it structure, propelling the different kinds of material - partly brittle, strange and even grotesque - to dance. A confrontation with history and art in Berlin's new center. Juergen Boettcher , also known under his pseudonym "Strawalde", was born in 1931 and grew up in a small village in the Oberlausitz. His childhood being overshadowed by the terror of the Nazi regime, he had a great desire for social change, and joined the Communist Party at the age of 17. He studied Painting at the Art Academy in Dresden. However, as a result of rising ideological turbulence, which led to his being blacklisted from the Association of Fine Arts, he was legally prohibited to continue his work as a painter. He then registered to study Film Direction at the "Konrad Wolf" Academy for Film & Television in Potsdam in 1955. It wasn't until the 1980s however that his original work as a painter was finally recognized. With more than 30 films, he has attained cult status among cineasts and has become a moral and aesthetic authority for his East German film colleagues at DEFA, the state-owned film studios of the former GDR. In 1991, he was awarded the Silver Ribbon for his film work, and is also honored with a portrait in the German Parliament. His films include: Ofenbauer (short, 1962) - winner of the Silver Dove Award, Jahrgang 45 (1965), Martha (1978), Die Frau am Klavichord (short, 1981), Rangierer (short, 1984), In Georgien (1987), Die Mauer (1990), A Place in Berlin (Konzert im Freien, 2001), and many more. Today, he lives and works again as a freelance painter in Berlin.